In this upcoming seminar, eHC Members and friends are welcome to join the eHC Networking Hour which will serve as the perfect place to meet and network with likeminded industry peers to uncover answers to shared problems, make new acquaintances in the industry and source new and beneficial partnerships. While computers have revolutionized the latter half of the 20th century, the field of robotics has the potential to alter how we live in the 21st century. Today robotic surgery is already a reality, helping doctors around the world to perform surgical procedures on patients. The most common surgical robot, as illustrated by the Da Vinci Surgical System, is a tele-surgical system: a doctor controls the robot to help him perform complicated surgery. Robots have dramatically changed selected surgical procedures for the better, reducing patient trauma, pain and subsequent scarring. In traditional operations, two or three surgeons (operator and assistants), an anesthesiologist and several nurses have to be mobilized. The commercial surgical robotic system provides two cameras to magnify the images and enhance visual effects, and two to three arms to assist the surgeon to make tiny incisions. To enable the surgeon to manipulate his instruments accurately in 3D space, a stereoscopic dual-camera endoscopic system was subsequently designed, with a wider viewing angle and an additional dimension of depth only available to the operator. The objective of this project is to utilize Information and Communication Technology to create 3D stereo viewing systems to support the robotic surgical service in Pamela Youde Nethersole Eastern Hospital (PYNEH). In 2009, a 3D Stereoscopic Visualization System for surgical robot was built. Since August 2009, about 300 major and ultra-major surgical cases have been operated using the above system successfully. Dr Carrison Tong has been working as a Medical Physicist for Pamela Youde Nethersole Eastern Hospital, Hospital Authority since 1996. He has built various medical imaging networks for different specialties including Nuclear Medicine Departments, Radiology Departments, Neurosurgery Departments, Ear Noise Throat Department, and Oncology Department for surgical and treatment purposes. From 1999 to 2003, Dr Tong was appointed as medical physicist in-charge for the building of the Tseung Kwan O Hospital as the first filmless hospital project in Hong Kong and PR China which project has awarded the ISO27000 certificate and an award in Hong Kong Information & Communication Technology (HKICT) Awards 2006. Dr Tong also has won other 8 HKICT Awards in 2007, 2008, and 2009 and Asia Pacific ICT Awards 2009. In US, Dr Tong has won two finalist certificates in the Science and Engineering Visualization Challenge 2006 and 2008 organized by National Science Foundation and Science. Dr Tong graduated from Southampton Solvent University in engineering and obtained his MSc in Engineering Computation from Queen's University of Belfast. He finished his PhD in Medical Imaging at the Royal Postgraduate Medical School, Imperial College, UK. The ability to manage change has become a key competency for those seeking to enhance organization efficiency and effectiveness. The change in organizations does not just happen. Typically, change will only occur if an initiative has direction, leadership, very clear goals and benefits for its key stakeholders, all of these are communicated well and in a timely manner. In this talk, the speaker will share the view in developing insights to help you lead others through the change process and foster adaptability and continuous learning. NLP, Neuro Linguistic Programming, was initially created by Richard Bandler and John Grinder in 1975 who began by developing models based on top communicators of the time. Their goal was to discover why certain people produced excellence and then to create models to allow other people similar behavior. Over the years, many people have contributed to the growth of this field. Emil Chan - with over 20 years? experience on IT, project management and back-office operations of foreign banks in Hong Kong, he was the First Vice President of Bayern LB leading the IT teams of the bank in Asia. He graduated from the University of Northern Iowa with an MBA degree. He is a certified trainer in Neuro Linguistic Programming (NLP) and also a member of the ISACA with a certificate of CISA. Emil is the Chairman of the Hong Kong IBM User Group, a non-profit-making organization for the IBM users in Hong Kong to do networking and idea exchanges. He is also the Chairman of the Offline Club and Web Care Award of Internet Professional Association to create opportunities for the members to exchange views in a fun and relaxing atmosphere and to promote e-Inclusion concept in Hong Kong respectively. Thomas Ding - has over 20 years of experience in IT and was the Project Manager of a global IT company. His work experience has well-equipped him with outstanding analytical and management skills as well as excellent communication skills. In the past years, Thomas has explored the power of communication skills in project management with the use of NLP and is committed to applying those skills to family, at work, as well as to sharing his thoughts with the community. He holds a MBA and is now a Certified Trainer of NLP, Registered Clinical Hypnotherapist and Certified e-Business Associate in Customer Relationship Management. eHC is pleased to host the ?Networking Hour? for our members and friends who want to meet one another to share their valuable experience, exchange their professional knowledge and discuss their products and services. It is a great way to meet people and get leads for your business. eHealth Consortium is pleased to announce a free quarterly seminar series in 2011 for members and the public, with the aims to boost the awareness of ehealth adoption for improved care delivery. 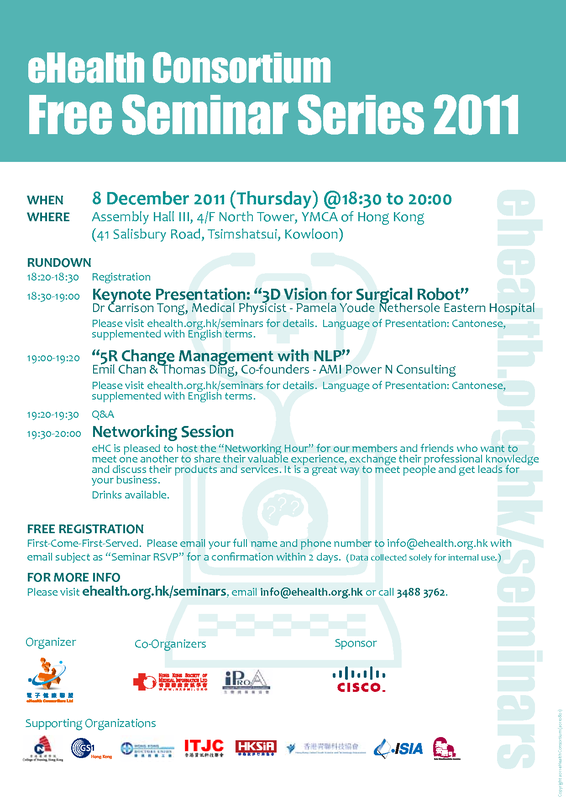 (Updated on 25 Jul 2011) Stay tuned for information on our next FREE seminar in early December (2011 Q4)!